We left yesterday for our sons graduation. we are proud of his accomplishments. But, beyond that, we are humbled by the man he has become. A Godly man, a loving husband, a tender brother. I like naps too. 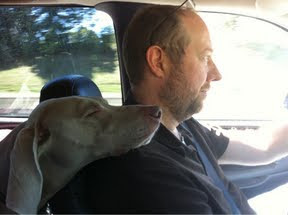 And, on our way out yesterday, our dog rested her head on Cliffs shoulder and napped. Jesus, I just want to rest IN you. Keep me running into your arms when my heart needs a nap. Say that again to my soul, Jesus. "Come nap in my arms, dear daughter. " Congratulations to your son, his wife and his parents...enjoy the rest.